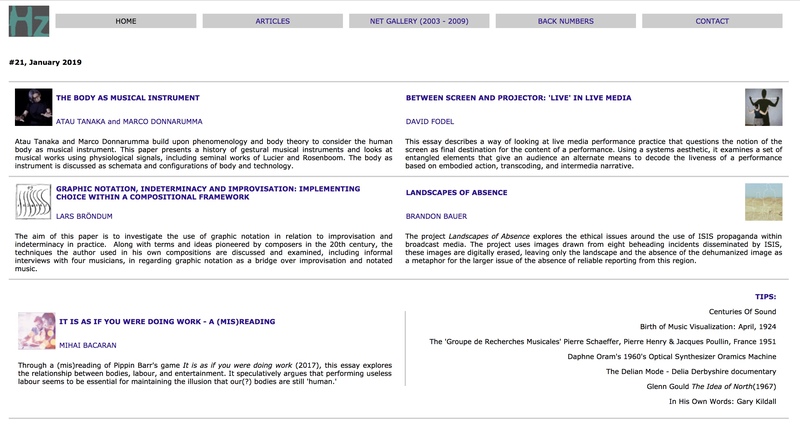 A long form essay about my project Landscapes of Absence was just published in Issue #21 of the Swedish intermedia art journal Hz. Hz started as a print journal after its predecessor Fylkingen Bulletin in the 1960s. Since 2000, Hz moved to the Internet and has become a web-based journal, one of the few in Sweden. Between 2003 and 2009 it also included Net-Art Gallery, where international Internet artworks were presented. Fylkingen is a non-profit art organization based in Stockholm. Established in 1933, it is the oldest forum for experimental music and intermedia art in Sweden. Throughout its history Fylkingen has been the driving force in the Swedish art scene to introduce and promote unestablished art forms, the examples of which include the music of Bartók and the video works of Nam June Paik as well as electro-acoustic music in the 1950s. Issue #21 also includes contributions from Atau Tanaka and Marco Donnarumma, Lars Bröndum, Mihai Bacaran, and David Fodel. Click here for the link to Hz Issue #21.